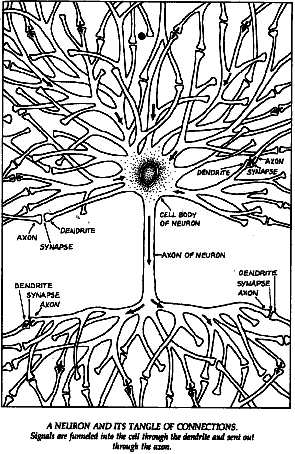 "A neuron and its tangle of connections: signals are funneled into the cell through the dendrite and sent out through the axon." Where, then, is the mind? Is it indeed “in the head,” or has mind now spread itself, somewhat profligately, out into the world? The question is a strange one at first sight. After all, individual brains remain the seats of consciousness and experience. But what about reason? Every thought is had by a brain. But the flow of thoughts and the adaptive success of reason are now seen to depend on repeated and crucial interactions with external resources. 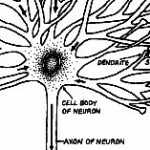 The role of such interactions, in the cases I have highlighted, is clearly computational and informational: it is to transform inputs, to simplify search, to aid recognition, to prompt associative recall, to offload memory, and so on. In a sense, then, human reasoners are truly distributed cognitive engines: we call on external resources to perform specific computational tasks, much as a networked computer may call on other networked computers to perform specific jobs. One implication of [David] Kirsh and [Paul] Maglio‘s demonstration of the role of epistemic action [PDF] is thus, I suggest, a commensurate spreading of epistemic credit. Individual brains should not take all the credit for the flow of thoughts or the generation of reasoned responses. Brain and world collaborate in ways that are richer and more clearly driven by computational and informational needs than was previously suspected. It would be comforting to suppose that this more integrated image of mind and world poses no threat to any of our familiar ideas about mind, cognition, and self. Comforting but false. For although specific thoughts remain tied to individual brains, the flow of reason and the informational transformations it involves seem to criss-cross brain and world. Yet it is this flow of ideas that, I suspect, we most strongly associate with the idea of the mind as the seat of reason and of the self. This flow counts for more than do the snapshots provided by single thoughts or experiences. The true engine of reason, we shall see, is bounded neither by skin nor skull. — Andy Clark in Being There: Putting Brain, Body, and World Together Again, (Cambridge, Massachusetts: MIT Press, 1998), p. 68. First published (Cambridge, Massachusetts: MIT Press, 1996). Cited in part by John Clippinger and David Bollier in “A Renaissance of the Commons: How the New Sciences and Internet Are Framing A New Global Identity and Order”. "Where, then, is the mind?" The epilogue illustrates this claim by considering the role of the brain in generating a complex linked stream of ideas. See also section 10.5. Posted on behalf of Andy Clark on Monday, May 3rd, 2010 under Quotations.